Consumers Energy delivers creative solutions to complex industrial challenges. Switch is building a $5-billion data center campus in Grand Rapids, Michigan. Assistance from Consumers Energy paved the way for this project, which will be the largest data center complex in the Eastern U.S. upon completion. What do a $5-billion data center, Michigan’s largest electric utility, and Grand Rapids all have in common? They represent the present and future of infrastructure-led site selection in the Upper Midwest, and Consumers Energy has taken over the driver’s seat. Without the round-the-clock work done by Jackson-based Consumers Energy on the site plan at the Pyramid Building in Grand Rapids, Las Vegas-based Switch never would have selected that location for the largest data center in the Eastern U.S. 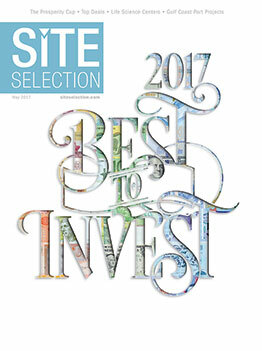 The multi-state site search for one of the most prized data center projects in U.S. history ended in Michigan because of a timely real estate deal and a proactive utility company that addresses every critical need and question facing its industrial clients. “We had been looking around the Eastern U.S. for a while, and in 2015, we ultimately purchased the iconic former Steelcase Pyramid, now known as the Switch Pyramid,” says Adam Kramer, executive vice president of strategy for Switch, which is planning to build a 1.8-million-sq.-ft. data center complex on the former Steelcase headquarters site in Gaines Township in Kent County. Consumers Energy answered “Yes” to both. Switch will use wind to power the 200-megawatt campus, which will be Tier IV Gold-rated and use the most modern technology developed in the data center industry. Without strong collaboration with Consumers Energy, Kramer adds, this deal never would have happened in Michigan. Because it did, 1,000 information technology professionals will be employed on a 142-acre campus that sat vacant for years. Tax incentives passed by Michigan lawmakers in late 2015 sealed the deal. The law exempts Switch and its co-located clients from paying sales or use taxes on servers, computers and other equipment for 20 years. Switch, a 17-year-old company whose 1,000-plus clients include Shutterfly, Amazon and eBay, plans a 10-year buildout of the Grand Rapids campus. Most Switch workers there will make between $60,000 and $200,000 a year. More than 700 construction workers are employed on site, and 99 percent are from Michigan. Arwood credits Consumers Energy with making the deal happen. Consumers Energy’s toolbox for new and expanding businesses includes its Energy Ready site inventory. The program — which is shared among Michigan Economic Development Corp., local community agencies and others — includes key utility infrastructure information that can lead to customized proposals, cost estimates and rate analyses based on how businesses use energy. As of April, the utility had confirmed 22 Energy Ready sites across its territory and is working to establish more. Beyond its inventory, the utility works with prospective businesses, state and local organizations and others to find sites equipped to meet customers’ long-term energy needs. Mayes adds that “our ability to supply critical energy infrastructure information to Switch was a key factor in why they chose this site. They are very sophisticated in how they use energy, and they understood how our business works.